An Atlas V rocket launches the U.S. Air Force’s X-37B military space plane on its maiden flight. It was launched from Cape Canaveral on 22 April 2010, and is currently operating in low Earth orbit. As the aerodynamic design is derived from the Space Shuttle, the X-37 has a similar lift-to-drag ratio, and thus a smaller cross range at high altitudes and Mach numbers than the Hypersonic Technology Vehicle. Most of the mission parameters for the OTV-1 flight have not been disclosed. The vehicle is capable of being on-orbit for up to 270 days. The Air Force stated the mission time will depend on progress of the craft’s experiments during orbit. James Oberg, an American space journalist, speculates that the concurrent launch of Air Force’s Hypersonic Technology Vehicle HTV-2 is related to the mission. 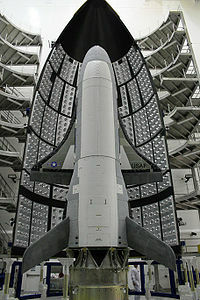 Part of X-37B’s mission profile might involve a simulated enemy attack, which X-37B should detect and autonomously react on it. HTV-2 was launched at 23:00 UTC on April 22, 2010, i.e., 52 min ahead of X-37B, from Vandenberg Air Force Base in California. May be it marks the beginning of military operations in space.